Berkery Noyes Represents Rockbridge Growth Equity In Its Acquisition Of Northcentral University - Berkery, Noyes & Co., LLC. 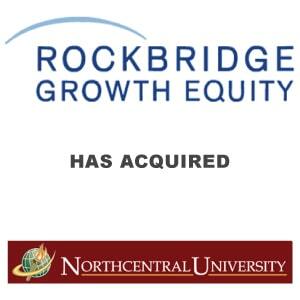 NEW YORK, January 6, 2009 — Berkery Noyes, the leading independent investment bank serving the education, information and technology markets, announced that the firm represented Rockbridge Growth Equity, LLC in its acquisition of Northcentral University. The terms of the transaction were not disclosed. Northcentral University (NCU), founded in 1996 and based in Prescott Valley, Arizona, is a regionally accredited online university currently educating more than 7,500 students in a variety of bachelor’s, master’s and doctoral programs. Combining rigorous academics with the convenience of 100 percent online degree programs, NCU is focused primarily on graduate-level degrees, with 95 percent of its students enrolled in doctoral and master’s online degree programs. NCU has enjoyed rapid growth in recent years, achieving an average annual growth rate of 47 percent since 2005. This growth is attributed to the high quality of its education curriculum and the flexibility afforded by NCU’s unique 100 percent online, one-on-one learning model. Rockbridge Growth Equity, a privately held investment group, has $150 million of dedicated capital and is focused on middle-market transactions in the financial services, consumer-direct marketing, business services and sports, media and entertainment industries. Rockbridge will apply its significant online marketing capability to growing enrollment at NCU. About Rockbridge Growth Equity: Rockbridge Growth Equity (www.rbequity.com) is a middle market private equity firm based near Detroit, Michigan. Rockbridge has $150 million of dedicated capital and is focused on middle-market transactions in the financial services, consumer-direct marketing, business services and sports, media and entertainment industries. Collectively, the partners in Rockbridge have completed transactions with an aggregate value of more than $2 billion. About Berkery, Noyes: Berkery Noyes is one of the pre-eminent merger and acquisition firms serving the information industry, and a market leader in the education space. Berkery Noyes’ clients include privately owned, publicly traded and investor-backed companies in the broadly defined information content and technology industries. The firm is based in New York City with a staff of forty professionals. For more information, visit www.berkerynoyes.com.